Researchers from the Leibniz Institute of Photonic Technology (Leibniz-IPHT) in Jena and the University of Edinburgh have succeeded in using a hair-thin fiber endoscope to gain insights into previously inaccessible brain structures. This study has been published in Light: Science & Applications. This could be a major step toward a better understanding of the functions of deeply hidden brain compartments, such as the formation of memories, as well as related dysfunctions, including Alzheimer's disease. Using a hair-thin optical fibre, the researchers looked into deep brain areas of a living mouse as if through a keyhole. Recently introduced methods for holographic control of light propagation in complex media now enable the use of a multimode fibre as an imaging tool. Based on this new approach, the scientists designed a compact system for fluorescence imaging at the tip of a fibre, offering a much smaller footprint as well as enhanced resolution compared to conventional endoscopes based on fibre bundles or graded-index lenses. 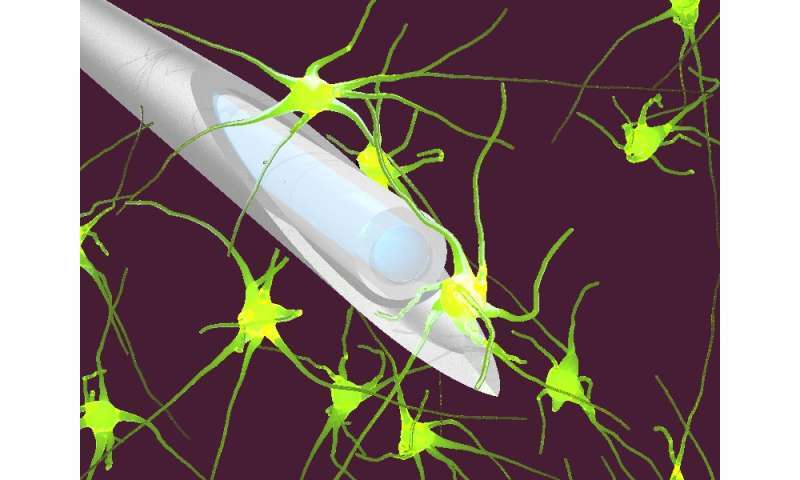 "We are very excited to see our technology making its first steps toward practical applications in neuroscience," says Dr. Sergey Turtaev from Leibniz-IPHT, lead author of the paper. "For the first time, we have shown that it is possible to examine deep brain regions of a living animal model in a minimally invasive way and to achieve high-resolution images at the same time," says IPHT scientist Dr. Ivo T. Leite. Sergey and Ivo work in the research group that developed the holographic method for imaging through a single fibre. Using this approach, the research team obtained images of brain cells and neuronal processes in the visual cortex and hippocampus of living mice with resolution approaching one micrometre. Detailed observations within these areas are crucial for research into sensory perception, memory formation and severe neuronal diseases such as Alzheimer's. 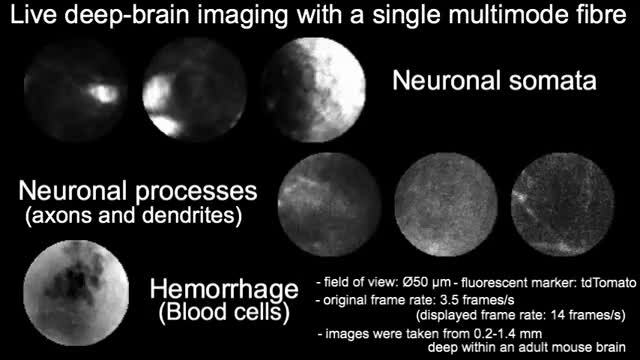 Current investigation methods are strongly invasive, such that it is not possible to observe neuronal networks in these inner regions at work without massive destruction of the surrounding tissue—endoscopes comprising hundreds of optical fibres are too large to penetrate such sensitive brain regions, while the neuronal structures are too tiny to be visualised by non-invasive imaging methods such as magnetic resonance imaging (MRI). "This minimally invasive approach will enable neuroscientists to investigate functions of neurons in deep structures of the brains of conscious animals without perturbing the neuronal circuits in action. It will be possible to reveal the activity of these neuronal circuits while the animal is exploring an environment or learning a new task," explains project partner Dr. Nathalie Rochefort from the University of Edinburgh.